Essential Fatty Acids (EFAs) have healing properties that are crucial for maintaining health. There are two types of EFAs: omega 3 and omega 6 fatty acids. The human body is not able to make these fats; therefore EFAs must be obtained from the diet. Without these fats, cells fail to grow and function normally, increasing the chance of cell abnormalities and degenerative disease. To maintain overall health, it is a good idea to keep the dietary intake of omega-3 and omega-6 fatty acids in balance. This means consuming approximately 10 times more omega-6 than omega-3 fatty acids. The modern diet is rich in omega-6 fatty acids. This is because most vegetable oils (corn, safflower and sunflower oils) we use today are high in omega-6 fats and low in omega-3 fats. To achieve more of a healthy balance select nutrient-dense, whole-foods high in omega 3 fats. The best sources of omega 3 fatty acids are flax seeds, flax seed oil, canola oil, English walnuts, soybeans, white-meat chicken, and fresh, cold water fish like salmon, herring, mackerel, and rainbow trout. Good sources include Littleneck clams, shrimp, Pacific oysters, and Blue crab. • Flax seeds can be freshly ground in a coffee or spice grinder and added to nut butter for a spread on bread, added to smoothies, oatmeal, yogurt or salads. For best results, grind the flax seeds immediately prior to use to ensure freshness. The essential fatty acids (EFA) in flax seeds can be adequately protected from rancidity by storing in the refrigerator. • Grind 1-2 tablespoons of flax seed and sprinkle it on cereal, yogurt, or on top of ice cream or other desserts — flax has a pleasant, nutty flavor. • Flax oil can be used as a spread, or used in place of or mixed with olive oil for salad dressings, in smoothies, over cooked vegetables or grains, or directly from the spoon. The recommended amount of flax oil is 1 tablespoon per day for most adults. o Check the label for unrefined, organic, and cold pressed for the best product. o Flax seed oil should not be used for cooking because it easily becomes oxidized and rancid if exposed to heat. o The oil should be stored in a black, opaque bottle in the refrigerator or freezer to protect it from light and heat (flax oil will remain liquid at freezing temperatures). 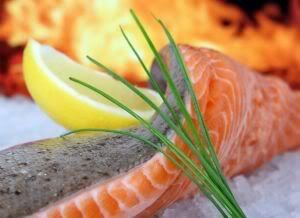 • Include cold water fish at least 1-3 times every week. Try salmon, herring, mackerel, and rainbow trout.